This practically made me cry. How could this ever be okay? I’m going to tell you a story that my tenth grade biology teacher told me. So, my teacher had a friend. She was happily married, a Christian, and pregnant. She and her husband were extremely excited about the pregnancy and they couldn’t wait to be parents. She was pretty far along - probably about 7 month in. She went to get a check-up, and her doctor checked out the fetus. Well, it turns out her fetus had hydrochephalus. 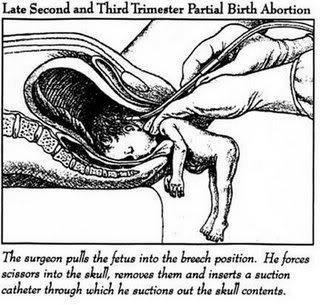 In this particular case, the fetus’s head had not and would not form enough to even hold the brain inside the skull. If the woman continued the pregnancy, she would give birth to a dead baby, and that’s if it didn’t die in utero and possibly cause sepsis before she had the opportunity to give birth. So, and this was before the “partial birth abortion ban” was enacted (not when the story was told, but when it took place), the woman opted to get an intact dilation and extraction procedure (since that’s the proper medical term, “partial birth abortion” is a made up term and has no medical relevance). Do you know what that allowed her to do? What that allows a lot of uterus-bearers in the same predicament to do? She was able to hold her dead, intact fetus and mourn for it. Now, she would have to get a procedure that literally rips the fetus apart, since apparently anti-choicers looking for a means to chip away at Roe v Wade think that this is a better alternative to the described procedure above. As the law currently stands, it is now impossible for people like the woman I described to have their fetuses aborted intact so that they can hold them like they wanted to. It is impossible for women like the one I described to have a body to mourn over. So good job. Because you’re too ignorant to actually know why uterus-bearers get late-term abortion, specifically intact D & X procedures, you’ve essentially made it much harder for those that are experiencing the difficult choice to end a wanted pregnancy to mourn and move on. But hey, go ahead and continue to consider yourself compassionate. I guess ignorance really is bliss, especially when you can hold up illustrations of medical procedures you don’t understand and hide behind them as if they have any meaning in the face of the reality that you refuse to acknowledge. Oh, but we’re getting closer to no late term abortions at all, because anti-choicers don’t care why. In the current climate, I wouldn’t be surprised if the woman were forced to carry her dying foetus to term or her own hospitalisation. can we have a cut tag or something for this pic? That was kinda triggering. I looked up intact dilation and extraction procedure. intact is not the words I would choose to describe it. I advise everyone to pick up a dictionary once in awhile. I don’t know what dictionary you’re using, but the ‘Intact’ is included in IDX because – unlike in Dilation & Extraction, which is still legal in the US because it doesn’t have an emotive sounding nickname – the foetus is not totally destroyed within the womb. It remains intact. I have no idea what you mean bby your claim that it doesn’t apply.